Realizing that you or someone you love needs help with an addiction can be an emotionally challenging time. Fortunately, Mississippi has a wide array of treatment options to serve individuals suffering from substance abuse. Mississippi is famous for its mighty river and is also heralded as being the Birthplace of American Music, due to the many famed musicians who hail from this state. Unfortunately, Mississippi is also a part of the of the substance abuse crisis facing the nation, and the Magnolia State is feeling the burden of addiction to heroin, opioids, meth, and alcohol across its plains. 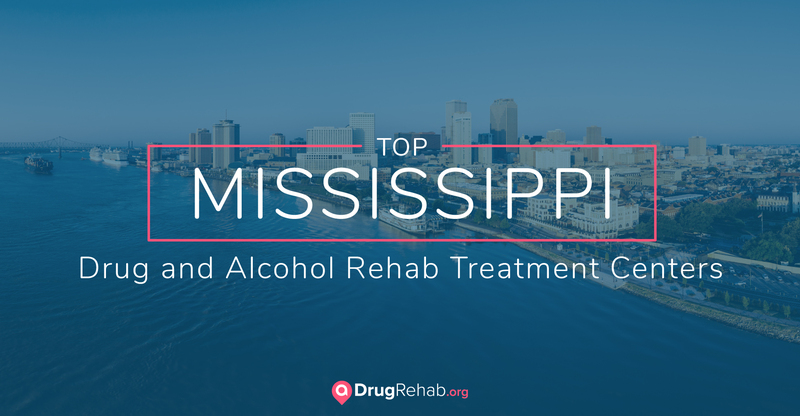 Mississippi has an array of substance abuse treatment options throughout the state. If you or a loved one is looking for drug or alcohol addiction treatment in Mississippi, here is a list of top facilities, ranked for their positive reviews and diverse approaches to treatment. At The Oxford, clients receive services ranging from initial detox and individual therapies to camping trips, expressive arts, and meditative yoga. The Oxford offers a 45-day program for ages 18 to 26 and a 30-day program for ages over 26. This rehab center also makes a unique “brand promise,” which vows that anyone who completes the 90-day program is likely to stay clean and sober, but if not, they are welcome to return for their relapse program. Turning Point describes their therapeutic program as intensive and deeply rewarding. This program starts with medically-supervised detox, then shifts focus to practical skill-building through intensive outpatient treatment, including stress management, emotion regulation, and relationship training. Turning Point also offers a valuable alumni network to serve as a support after treatment has ended. Since 1973, this treatment center has been committed to providing high-quality and effective care to those suffering from substance abuse and mental health issues. Through a multi-phase, residential program, clients are given access to services for family, legal, and aftercare programs. Harbor House offers a diverse, therapeutic approach to adventure-based counseling through its distinctive ropes course. This faith-based recovery center has been in operation since 1965 and serves both men and women. Home of Grace offers a 90-day residential treatment stay and comes with very positive reviews. There are separate campuses for men and women, and the facility proudly provides long-term aftercare support to its alumni family. Pine Grove provides inpatient, outpatient, and residential programs in the hills of South Mississippi. In addition to treating substance use disorder, Pine Grove offers a family program that educates on the concept of addiction as a disease and compulsive behaviors. This component can help heal the broken trust between family members by reducing shame and increasing understanding and accountability. The continuum of care at Fairland Center is comprehensive in its offerings, including detox, residential, and halfway house/sober living programs. Fairland offers medication-assisted treatment (MAT), as well as dual diagnosis care. Fairland serves men and women and is also able to accept pregnant and postpartum women and their children. When someone is ready to seek treatment for substance abuse, one of the first steps they will likely go through is the detoxification process. Detox happens when the toxins leftover from drug use begin to leave the body and the person enters acute withdrawal. Withdrawal can be extremely uncomfortable, and even dangerous, depending on the drugs that were being used. For example, withdrawing from opioids is painful, but not usually dangerous. Withdrawing from alcohol, benzodiazepines, or barbiturates can be dangerous and even life-threatening and should take place under medical care. Many treatment facilities across Mississippi provide medically supervised detox programs, helping clients get through the withdrawal stage in a protected environment. Although detox can be uncomfortable, it is only temporary and marks the first step toward a new life in recovery. While it’s encouraging to have so many treatment facilities in Mississippi to choose from, the search for the right program can feel overwhelming. A good place to start is by understanding the different types of treatment, including inpatient rehab. Studies show that long-term treatment (at least 90 days) greatly increases an individual’s chance at recovery. A dual diagnosis, also known as a co-occurring disorder, occurs when an individual is suffering from both substance abuse and a mental health condition. Dual diagnoses can require specialized treatment, as the two disorders tend to feed off one another, and standard treatments can be insufficient. Historically, co-occurring disorders have been misunderstood in treatment, resulting in patients not getting the level of care they needed. Fortunately, there are now treatment centers whose programs specifically focus on treating dual diagnosis. The Ranch Mississippi in Brandon, offers medical detox programs and co-occurring disorder services, along with “preparation for real-world recovery [and] help for the chronic relapser.” The Ranch Mississippi has a team of licensed therapists that regularly treat substance use disorders in conjunction with other mental health disorders and are trained to help clients integrate recovery principles into their lives after treatment. Entering substance abuse treatment can be an extremely humbling experience. The process can leave clients feeling vulnerable, so it’s important that individuals feel safe and respected in all treatment settings. For this reason, many choose a gender-specific treatment center (women-only or men-only) resulting in a higher level of personal comfort. For others, an LGBT-centered treatment facility is where they might feel the most at home. Born Free Primary Residential Treatment in Jackson offers treatment to lesbian, gay, bisexual, and transgender individuals in a residential setting. Born Free also utilizes trauma-related counseling, Twelve-Step facilitation, and relapse prevention. Luxury rehab facilities typically offer similar treatment methods as traditional centers, but will be in more sumptuous surroundings. The main difference that luxury rehab centers provide is the upscale amenities, such as fine dining, personal fitness instruction, and private accommodations. Although this style of treatment will usually have a higher price range, luxury rehab centers provide an unparalleled level of care. Those attending a luxury rehab facility in Mississippi will be provided with significant variations in treatments and be given access to some of the top treatment specialists in the industry. When researching options for substance abuse treatment, it can be tempting to go with the shortest program, especially if you have a job or family waiting. But individuals should be aware that those who enter addiction treatment for at least 90 days see the most positive outcomes. When it comes to detoxing from a substance, the withdrawal symptoms can vary depending on the drug(s) used. Detox from alcohol, barbiturates, or benzodiazepines should be completed in a medically supervised setting, as withdrawal from these drugs can be dangerous. Medication-assisted treatment (MAT) can be a helpful asset to those who are withdrawing, as its main goal is to reduce and eliminate the symptoms associated with withdrawal. Opioid withdrawal can be extremely uncomfortable, but is not usually dangerous. MAT can be a relapse-prevention tool, as it works to relieve symptoms of withdrawal and allow the client to begin the recovery process. For opioid addiction, buprenorphine medications like Suboxone are typically prescribed. Occasionally, methadone will be prescribed, though it has a much higher margin for abuse than buprenorphine. The Drug and Alcohol Detox Clinic in Hattiesburg offers extensive services for opioid addiction, including MAT, counseling, supervised withdrawal, medical exams, and confidential outpatient services. Often, those who are facing addiction make choices that result in legal difficulties. This can lead to the court system requiring individuals to complete a court-ordered rehab program. Warren Yazoo Behavioral Health, with locations in both Vicksburg and Wazoo City, works with criminal justice clients to provide the services needed to restore them to good legal standing in the community. Intensive outpatient (IOP) treatment can be a great option for those who have just completed an inpatient facility stay, or who have a low chance of relapse and are not in any medication-assisted programs. However, in an outpatient rehab center in Mississippi, individuals return home each night, rendering it a less protected treatment environment. Additionally, outpatient treatment programs have higher dropout rates than inpatient facilities. If you’re struggling with severe addiction or substance abuse issues, consider an inpatient stay for the initial portion of your treatment, in order to build the most solid recovery foundation for yourself. IOPs and partial hospitalization programs (PHPs) can be helpful choices for continued care, or for those who cannot attend inpatient treatment due to personal or professional reasons. Support groups and community services are also considered outpatient treatment and can serve as an essential part of a recovery support network. New Life Deliverance Center is a faith-based outpatient treatment program in Waynesboro, Mississippi that treats both men and women through therapies with licensed counselors. Although some rehab centers in Mississippi can be pricey, the majority of treatment centers are made affordable through both public healthcare and private insurance options. Public insurance like Medicare and Medicaid is also accepted at some treatment facilities. If treatment still feels like a financial reach, most people are at least partially covered by government- or state-funded insurance vouchers. Some treatment facilities across Mississippi also accept scholarships, sliding-scale fees, and payment plans to offset initial costs and ensure the person suffering receives treatment as soon as possible. These many treatment options speak to the community’s desire to reverse the daunting addiction and substance abuse issues in their state. While Mississippi’s alcohol and drug misuse rates are indeed high, perhaps the most alarming fact is how infrequently those who are suffering seek treatment. Over 100,000 Mississippi residents struggle with alcohol dependence or abuse each year, and less than one percent of those struggling seek treatment. Of the 61,000 people in Mississippi who suffer from drug addiction, just four percent seek professional help. Although addiction doesn’t discriminate — it affects people regardless of age, gender, sexual orientation, or socioeconomic status — it does follow certain patterns throughout each state. The opioid crisis has hit Mississippi particularly hard. In 2012, there were 120 prescriptions for painkillers per 100 people in Mississippi – that’s enough for every single Mississippian to have at least one bottle of opioid prescription drugs. For more information on finding a drug and alcohol rehab center in Mississippi, contact a treatment specialist today.